I‘ve never read any of Kathy Reichs’ books following Dr Tempe Brennan, and I’ve not seen Bones, the television series based on those books. I have, however, read Virals by Reichs, the first in a series featuring the great-niece of Tempe – Tory Brennan. 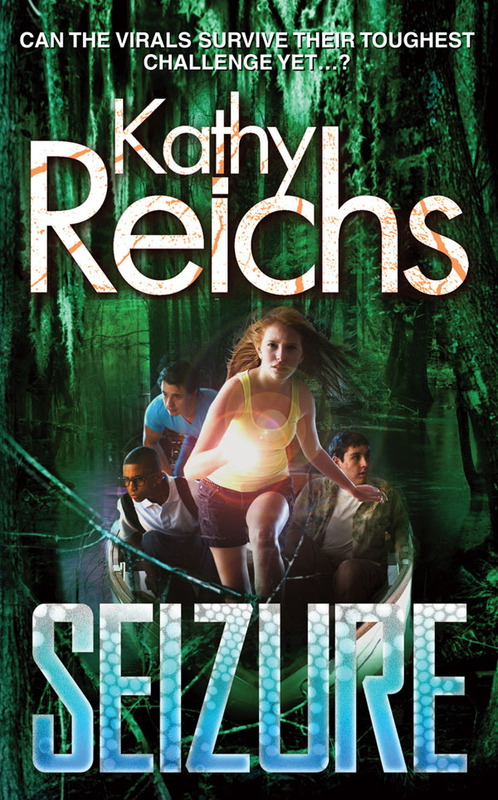 Seizure is the sequel to Virals, and it’s jam packed full of action and terrifying moments. Tory and her friends – Ben, Shelton and Hi – are still trying to come to terms with the “powers” they got when they contracted a human form of parvovirus. They’ve also just discovered that the research facility their parents work on, and Loggerhead Island where it is housed, is about to be sold. This prompts the Virals to head off on their next adventure – a search for treasure buried by pirate Anne Bonny in the 1700s, and which could raise enough money for them to save Loggerhead. What follows is close to 500 pages of really tense action. Reichs is skillful at crafting a world the right side of realistic, in spite of the fact that her characters have special powers some of the time. Tory Brennan is a great heroine – brave, clever and still trying to deal with all the rubbish that comes with being a teenager (a boy who likes you but you don’t like back, mean girls at school, your dad’s new girlfriend) even while coping with the more unusual elements of her life. The mystery at the heart of Seizure was well done, and I was unable to guess what was going to happen until I was actually reading about it. For anyone who read Enid Blyton’s Famous Five series when they were younger, the Virals series is like that (four teenagers and a dog), but ramped up 10 times and firmly set in the 21st century. Seizure is a great sequel that lives up to the promise of the first novel in the series, and it‘s also enough to prompt me to want to hunt out the Bones books.